Leaving Japan: Nuclear Fears Send Americans Packing Many Americans and other foreigners, fearing the worst in the nuclear crisis, are fleeing Japan. "Just in case, we don't want to wait until the last possible second" to go, said Sandra Horowitz, who was heading to Narita International Airport for a flight to Portland, Ore., with two of her children. 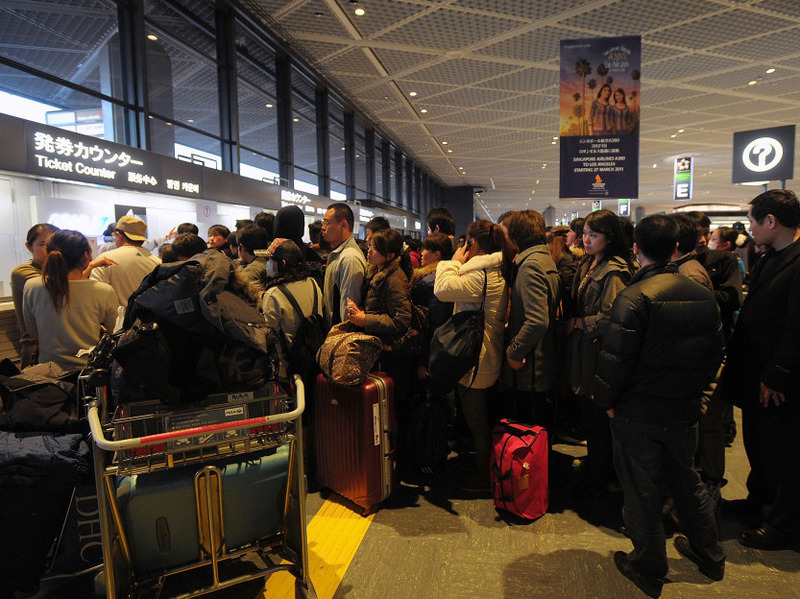 People line up to buy tickets for the earliest possible flight Friday at Narita International Airport. Many Americans and other foreigners, fearing the worst in the nuclear crisis, are fleeing Japan. They say they'd rather not take the chance and wait too long in case things gets much worse. On Roppongi Street in downtown Tokyo, passengers board an express bus to Narita International Airport. Sandra Horowitz loads her golden Lab, Kiki, and her cat, Bootise, both in cages, into the bus's luggage hold. "It is a very difficult decision to leave," Horowitz says. "But I have ... three children, one in the States now, so it was the right thing to do for now, and my husband will be staying here." She and her children — Caroline, age 17, and Evan, 14 — are headed for Portland, Ore.
"I think we're just concerned about a lot of different things that are going on, you know, the nuclear plant situation. And just in case, we don't want to wait until the last possible second," Horowitz says. And she has lots of company. Friday morning, Narita was packed with travelers. Long lines, made up largely of women with children, snaked from the check-in desk down the hall into the shopping and restaurant area. Just in case, we don't want to wait until the last possible second [to leave]. The largely American crowd was headed for familiar sounding places — Tennessee, Los Angeles, Detroit. Navy wife Elizabeth Morrow and her daughter, Brenna, were among them. "My husband's deployed, and knowing that he's not home that really makes me feel unsafe with my 2-year-old child, so that's why I'm going home," Morrow says. Like everyone in Japan, Morrow has been following the crisis at the Fukushima Dai-ichi nuclear power plant with a mix of fear and confusion. "I'm not a nuclear physicist, I'm not a doctor, but you hear the word radiation, and yes it could be like having a chest X-ray," she says. "But that word is a scary word. I mean, you have a 2-year-old child. If you don't feel like you can go outside and let her play and enjoy the fresh air and enjoy being a child then that's kind of what's making me feel unsafe." Kim Barber was leaving for Oregon. "It's a precaution," she says. "You just never know what's going to happen. Family members are concerned, and I don't want to give them heart attacks." Barber's husband, who is Japanese and works at a software company in Tokyo, is staying behind. So, she pushes a huge luggage cart with one hand. The other guides a baby stroller that holds her 18-month-old son, Shukun. "I don't want to be 10 years down the road and him have cancer and then thinking to myself, it's because I stayed," she says. In contrast to the tense scene at the airport, back in downtown Tokyo things seem calm and quite normal. Shinichi Morisada is on his lunch break. He says he's not nervous. "No, no, not at all," he says. Morisada, who works for a real estate company, says his colleagues are calm, too. Still, Norita Satiyo, who works in an office nearby, doesn't blame the foreigners for leaving. "If I stayed ... overseas and faced such an accident, I think [I would] go back [to] Japan," she says. Nobuaki Matsura, a systems engineer, agrees with Satiyo. He thinks it's reasonable for foreigners to leave Tokyo but says that's making Japanese people nervous. Despite the calm and stoicism on the surface, things aren't normal. The news on the reactors is troubling; the rolling blackouts at night are eerie. The images from the north are devastating. Some Tokyo residents are hoarding food. And the aftershocks from the earthquake still come.